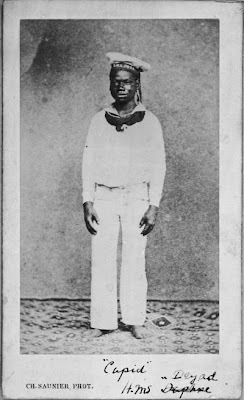 US Slave: 'Cupid' - an officer's servant on board HMS Dryad. 'Cupid' - an officer's servant on board HMS Dryad. Description: This boy, nicknamed Cupid, was originally of the Nyoro tribe. He had been captured in the Kingdom of Bunyoro, in the far northwest of present-day Uganda near Lake Albert. During this period the Kingdom of Bunyoro was often at war with the Kingdom of Buganda to the south, and captured people were often sold to the Arab slavers in exchange for cloth and metal goods. After being marched over 1300 km to the coast of Tanzania, possibly to Bagamoyo, the boy was sold again and given the Moslem name of Mabruk. It appears that he was placed on a dhow for shipment to either Zanzibar, Madagascar or Arabia. The dhow was intercepted by HMS 'Daphne' in 1868 and Mabruk was employed by the Royal Navy. Mabruk became an officer's servant on board HMS 'Dryad' and was in Mauritius where this photograph was taken around 1870. There is no indication of Mabruk's age, though he may have been around nineteen at this time. There is a forty-year-old ex-slave from East Africa by the name Mabruk, who appears in the 1891 census as a coal trimmer on board the P&O vessel SS 'Java' in the port of London. Although it is impossible to be sure that this is the same man, it was common for ex-slaves who had been employed in the Royal Navy to later seek employment in the merchant navy.